The hornbeam or carpinus betulus is a deciduous tree popular for hedging purposes. It has gained its popularity as a useful alternative to the common beech, to which it bears a striking resemblance. The main aesthetic differences are that the leaves of a hornbeam are smaller, have deeper nerves and serrated edges. Beeches are less prone to defoliation than the hornbeam, as the latter tends to shed more of its leaves during the winter than the beech will. In regard to its appearance, the common beech has slightly more to offer than the hornbeam, but it can also be too demanding in certain situations. That is when the tough and undemanding nature of the hornbeam will give you a similar look under more difficult circumstances. Hornbeam hedges are frost hardy, semi-evergreen hedges with appealing green foliage, turning orange or yellow in the autumn. Most of the leaves stay attached to the branches during the winter. Hornbeam hedges stand out from other types of hedges due to their hairy branches and finely serrated foliage. As a bonus, this widely grown native hedging plant produces hop-like fruit known as ‘catkins’ during the summer months. The catkins will gradually change into winged fruits, which are called ‘samaras’. The fruit serves as an important food source for several species of birds, who fill their stomachs with these samaras in the autumn. Due to its relatively dense growth, hornbeams can also make a great nesting location during springtime. The origins of the hornbeam can be traced back to southern Europe and western Asia. These days, the hornbeam can be seen all over Europe and parts of the Middle East. Before its ornamental value was discovered, the hornbeam was already a highly popular tree, because its hard, dense and heavy wood is extremely useful. It has many different applications, but its use in the production of laminate and piano hammers might be the most notable uses of hornbeam wood. In addition, this type of wood burns hot and slowly, which makes it very suitable as firewood – yet another thing that the hornbeam has in common with its more demanding lookalike. It was only a matter of time before people would discover how suitable the hornbeam is for hedging purposes. It is quite tolerant to pruning, which is why the hornbeam is frequently planted in public parks these days. Additionally, it is often used for landscape gardening and is even suitable for topiary purposes. This species can grow as tall as 30 metres, but in a hedgerow, the shallow and wide-spreading root system of the hornbeam does not get as much room to grow, which forces the tree to keep itself in check. Another remarkable feature of the hornbeam is its bark, which will remain smooth and greenish grey even when it reaches old age. This is a nice bonus as the foliage is not very dense. Around 40 hornbeam species can be found all over the northern hemisphere, but for growing a hedge in a British garden, carpinus betulus is by far the most suitable plant of the carpinus genus to work with. The English name of the species refers to its exceptionally hard and tough wood, which is considered to be as hard as the horn of an animal and therefore is sometimes called “ironwood”. The “beam” in its name is the Old English word for tree. Since hornbeam responds very well to pruning, it is possible to cut your hornbeam hedge into a neat, formal shape. Even topiary is an option. And if you are looking for an informal hedge that will give your garden a more traditional, perhaps rustic look, the hornbeam can give you what you want as well. 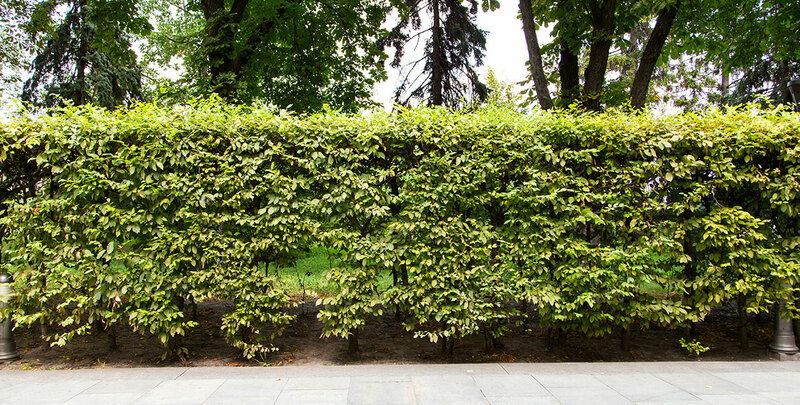 This undemanding hedging plant will be a good fit for any garden, from modern urban gardens that require a contemporary hedge to countryside gardens in need of a hedge that will emphasise the natural beauty of the surroundings. This explains the immense popularity of the hornbeam. The fact that it is a fantastic addition to almost any garden has made it one of the most sought-after hedging plants in recent years. And rightfully so. Since hornbeam is native to southern England, among other areas, it will be able to thrive in the British climate, which has proven difficult to some species due to the relatively large amount of rain. 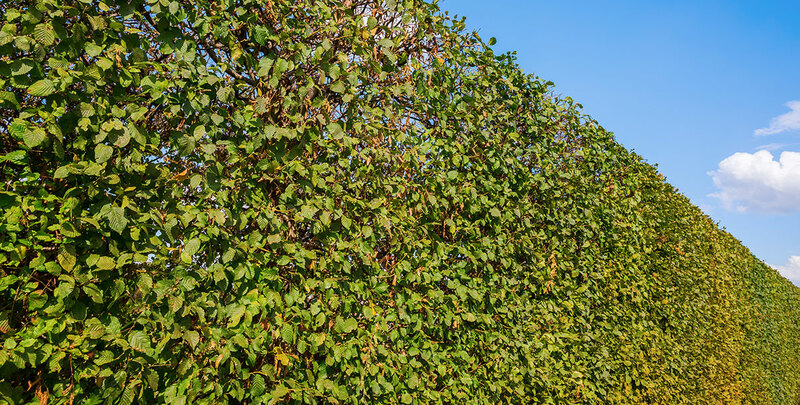 This is one of the most prominent reasons why hornbeam hedges are often used as an alternative for beech hedges, as they will combine a look that is reminiscent of a beech hedge with a much higher tolerance of water. So, if your garden is located in an area that has to endure a lot of rain, you should not feel discouraged to plant a hornbeam hedge around your garden. It will not mind. In fact, hornbeam likes a moist soil. Hornbeam hedges are versatile and tough. They are able to grow in most common soils, including clay, chalky soils and even wet soils. This is where the horn beam really proves the value of its existence alongside the beech. 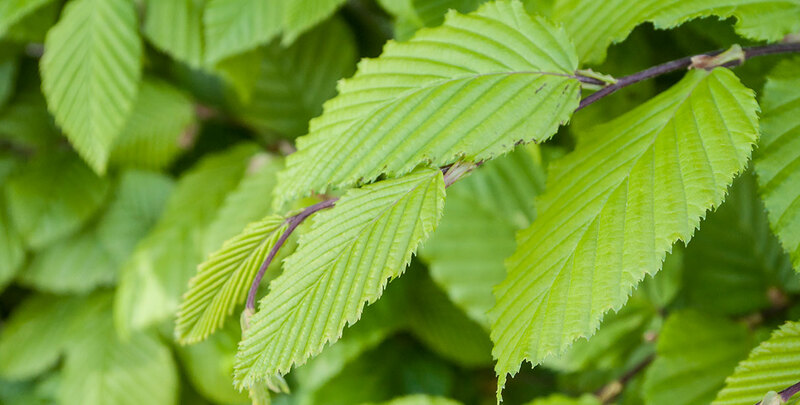 The hornbeam prefers fertile, well-drained soil types and will grow best in the sun. However, it will also perform well in the shade. Hornbeam hedges can cope with exposure to wind, making it a suitable barrier hedge or windbreak, but it will not tolerate excessive amounts of salt. The best time to plant a hornbeam is sometime between November and March, as this allows the plants to establish themselves and develop roots. A hornbeam grows at an average rate of 20 to 40 cm per year, which can be controlled by means of annual pruning. After planting your hornbeam hedge, we advise you to hold off pruning until it reaches its desired height. The hornbeam is perfectly suitable for low hedging, but if you would like your hedge to ward off the curious eyes of passers-by, it should not be pruned until after it grows past eye level in order to create a decent privacy hedge. Pruning once a year should be enough if you want to maintain its shape. The top and upper reaches of a hornbeam hedge should be pruned harder than the lower reaches, because their exposure to light causes them to grow more vigorously. The best time to prune your hornbeam hedge is in September, shortly after its second – and smaller – flush of growth. Many people cannot tell the difference between a beech and a hornbeam, which can be a good thing if you enjoy the appearance of the classic beech hedge, but cannot quite meet the relatively high demands of the common beech. The hornbeam provides you with the opportunity to achieve this look in your garden, whilst simultaneously relieving you of some of the worries you might have about whether or not your hedge will grow properly. Hornbeam has a different look for every season. Although beech has somewhat brighter autumn colours and denser foliage during the winter months, hornbeam will give you similar aesthetic values throughout the year if maintained properly. One of the biggest advantages of a hornbeam hedge, however, is the fact that it is so easy to grow and maintain. This makes the species an excellent choice for inexperienced gardeners, as there are not many things that can go wrong with this easy-going plant. Especially when compared to the similar-looking beech, which is a bit of a diva when it comes to soil requirements. 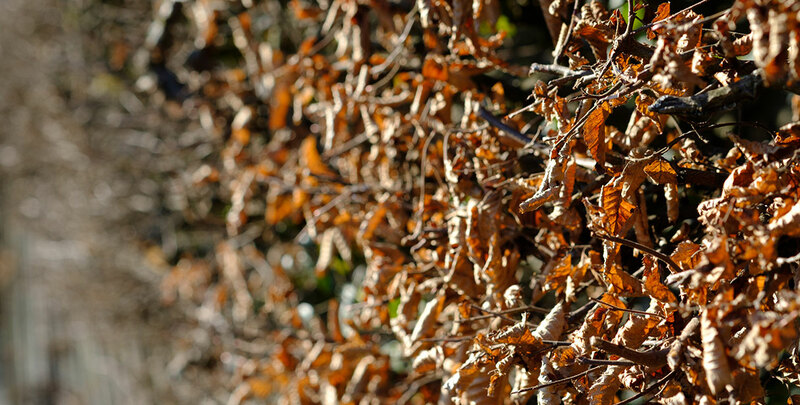 It may not always have the benefit of retaining its dry leaves through the winter, but it will certainly spare you a lot of worries and effort if an appearance similar to a beech hedge is what you are after. Hornbeam will certainly not mind if you choose to plant your hedge in a wet soil or in relatively heavy clay.